The North States Supergate Easy-Close Gate Metal keeps your child or pet always safe and secure. Gate swings open both ways and offers double locking system with easy one hand operation. Gate is 29" high and fits openings 28" to 31.5" wide. Expands to a maximum 38.5” wide with two extensions included. Gate is pressure mounted and easy to install using tension knobs to secure the gate in opening. No hardware required. Ideal in a variety of room openings or at the bottom of stairs. Designed in a white powder coated metal construction, the North States Supergate Easy Close Gate Metal will give you a lot of durable service. Want to increase the width of your gate? Sold separately there is a 3-Bar extension (order ASIN B01AXN23OY) which will increase the width of the 4910 or 4910S Easy-Close Gate 7" Inches to a total of 45.5" in width. 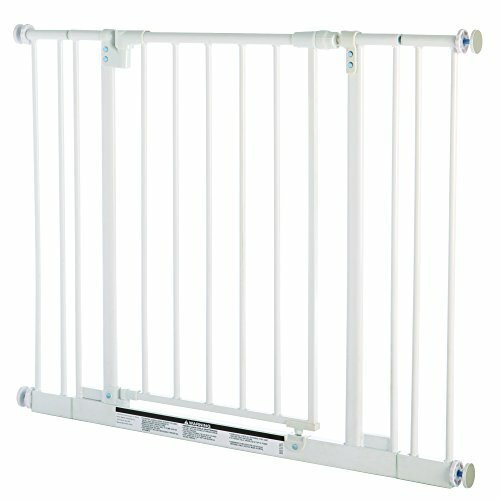 Or, ASIN B01B345KOW Easy Close Extension, 10.5” which adds an additional 15” inches to the gate (Extension sold separately). The Easy-Close Gate shuts firmly yet easily with one simple push, keeping your child safe and secure. The safety gate swings open both ways for added convenience and offers a triple locking system for peace of mind. To keep the child gate open for multiple pass-throughs, simply use the hold-open feature to prevent the gate from closing. This baby gate pressure mounts easily by using tension knobs to secure the gate in place. Ideal for a variety of room openings or at the bottom of stairs measuring 28" to 38.5" wide and is 29" high.